Starting at age 21, you get regular pap smears. You get in your car, drive on a paved road to an Ob/Gyn or primary care clinic, and have the pap done, with relatively little effort on your part. That’s how cervical cancer screening works for most women in the United States and most other developed countries. In these countries, pap smears have significantly reduced rates of cervical cancer and resulting deaths. It’s a different story in developing countries like Kenya. In East Africa, cervical cancer is the most common cancer in women, even surpassing breast cancer. In Kenya, only 3.5% of eligible women ever get screened for cervical cancer, and it’s difficult for those that screen positive for precancer or cancer to access treatment. Some barriers relate to infrastructure, as cervical cancer prevention and treatment requires resources including skilled providers, supplies, and transportation of specimens. To try to overcome some of these systems issues, Dr. Megan Huchko (director of the Center for Global Reproductive Health at Duke) is overseeing a study in western Kenya in which women self-screen for human papillomavirus (HPV), the virus that causes cervical pre-cancer and cancer. Women self-screen at health campaigns in their communities so they don’t have to travel to a clinic or need a pelvic exam. Women who are HPV-positive are referred for treatment at one of four treatment sites in the surrounding area. The study was designed to provide a streamlined screening and treatment path for women, but they still face many barriers. For one, access to transportation is limited. The women in the study live in rural areas, and no one has a car. They are lucky if they have the money to pay for a motorcycle ride to the treatment site. The roads they travel are bumpy dirt roads that become impassably muddy during the rainy season. Some women end up walking, in some cases up to four hours each way. Most of these women have young children to care for. A majority of women dropped out of school after elementary school contributing to the barrier of low health literacy. In a region where men have significant influence over women’s health choices and access to services, lack of a partners’ support can be an omnipresent barrier. For example, if a woman needs money from her husband for transportation to the treatment site but her husband doesn’t want her to go, the conversation ends, and she won’t be able to access treatment. I’m currently in Migori, Kenya working with members of Dr. Huchko’s team. In my research, I am working to identify patient and systems-level factors associated with whether or not HPV-positive women get treated. In this way, I hope to identify barriers that can be addressed to increase treatment rates. 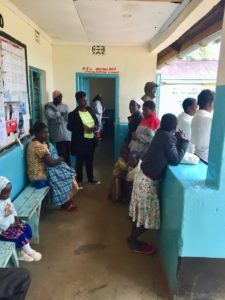 The cervical cancer prevention process here in Kenya is far from women’s experience with pap smears in the US, but through innovative methods like self-screening in communities, I hope more women will be able to access screening and rates of cervical cancer in Kenya will continue to decrease. Information Centre on HPV and Cancer. Human Papillomavirus and Related Diseases Report: Kenya. ; 2017. http://www.hpvcentre.net/statistics/reports/XWX.pdf.